Removable Bike Bollards are multi-functional, traffic guidance and bike storage solutions. They divert traffic, prevent access, define access routes for vehicles AND their secure bike-locking arms provide top-notch security for bicycles. Best of all, removable bike bollards can even be temporarily removed to allow temporary access to emergency and delivery vehicles or to change access routes on a seasonal basis. Reliance Foundry’s series R-7900 and R-8900 bike bollards are devices that were designed specifically for changing access applications, making them the least complicated option available. They are installed with an in-ground receiver so that its top sits flush with the asphalt surface. The receiver (aka mount or sleeve) holds the bike bollard and features a lid or chain with a locking mechanism to prevent theft or misuse. Receivers that feature a lid can be closed to disguise the mounting hole. Reliance Foundry’s removable bike bollards with below-surface receivers are available in powder-coated steel or stainless steel and offer an exceptionally long service life. Reliance Foundry’s series R-7900 and R-8900 provide the ultimate in bike-friendly access control. Please note that price of the in-ground receiver is not included in the listed price of the removable bike bollard. To calculate the total cost of the unit, the price of the receiver must be added to unit price of the removable bike bollard. When a site’s architectural integrity must be maintained, Reliance Foundry’s standard, decorative metal bike bollards can be installed with premium removable mountings to become traffic guides in changing access applications. Premium mountings are sleek devices that actually retract into the concrete grade when the retractable bollard is removed. 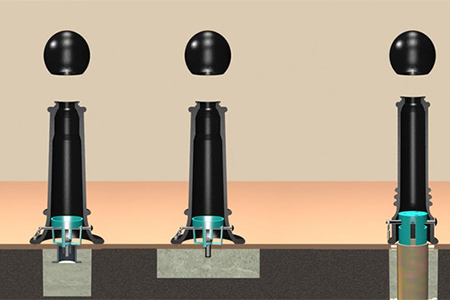 This removable & retractable mounting system requires the operator to pull a pin from the base of the bike bollard before the bike bollard is removed from its mounting. Once the bike bollard is removed, the mounting bracket is twisted and retracted into its mount creating a mount that is flush with the grade, posing no tripping hazard. Please note that price of this specialized mounting must be added to the price of the actual bollard to calculate the total price of the removable unit. Reliance Foundry’s cost-sensitive removable mounting provides another option for installing standard, decorative bike bollards. It can be set in either existing or new concrete surfaces and is designed for quick removal. The economy removable mounting requires the operator to remove a lock and pull a pin from the base of the bike bollard before the bike bollard is removed from its mounting. Once the bike bollard is removed, the mounting bracket can be removed with a wrench. Once the bike bollard is removed, the mounting bracket must be taken off the concrete surface to eliminate any potential tripping hazard. Should the field requirements of the site ever change, this mounting can also easily be transformed into a standard, decorative mounting. No matter, what option used to mount a removable bike bollard by Reliance Foundry, it will deliver a new level of convenience to a streetscape and provide flexibility in access control. Being familiar with all the options available will help to keep a project on budget and ensure that the correct removable bollard is used on every site.